This special issue represents the initial products of the first five years of a multi-center project entitled "Origins of Communicative Disorders." 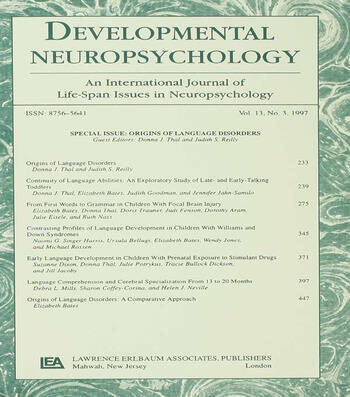 As the title implies, the common goal of investigators involved in this project was to describe the development of communicative skills from their earliest measurable points so that factors characterizing the earliest stages of communicative disorders can be teased apart from those which lead to development of typical language ability in later childhood. The papers in this volume provide a comprehensive picture of early language development and its neural correlates across a range of typical and atypical populations. By looking at language abilities from their point of origin--from the very first signs of word comprehension to the emergence of grammar--the authors construct a foundation for future research on the nature and etiology of communication disorders. Volume 13, Number 3, 1997 Contents: D.J. Thal, J.S. Reilly, Origins of Language Disorders. D.J. Thal, E. Bates, J. Goodman, J. Jahn-Samilo, Continuity of Language Abilities: An Exploratory Study of Late- and Early-Talking Toddlers. E. Bates, D.J. Thal, D. Trauner, J. Fenson, D. Aram, J. Eisele, R. Nass, From First Words to Grammar in Children With Focal Brain Injury. N.G.S. Harris, U. Bellugi, E. Bates, W. Jones, M. Rossen, Contrasting Profiles of Language Development in Children With Williams and Down Syndromes. S. Dixon, D.J. Thal, J. Potrykus, T.B. Dickson, J. Jacoby, Early Language Development in Children With Prenatal Exposure to Stimulant Drugs. D.L. Mills, S. Coffey-Corina, H.J. Neville, Language Comprehension and Cerebral Specialization From 13 to 20 Months. E. Bates, Origins of Language Disorders: A Comparative Approach.